Home Articles Drugs Why is synthetic marijuana becoming the drug of choice for UK’s lower class? 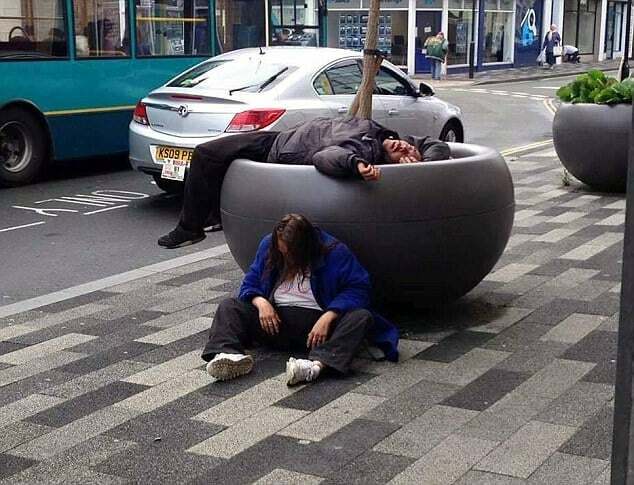 There is an alarming trend gaining steam on the streets of various UK towns right now – homeless people and other poor citizens are increasingly turning to synthetic marijuana as their preferred intoxicant. While substance abuse is not a new problem among the homeless, this latest development is posing additional dangers and should be taken very seriously by the responsible authorities. Traditionally, alcohol and heroin were the most represented drugs on the social margin. However, UK government has driven the prices of alcohol way above the reach of poor people, leaving them to search for even more harmful alternatives. With natural cannabis also quite pricey and street-level heroin containing very little of the active substance, destitute people embraced the only high they could afford – and it was synthetic weed. Cheap, easy to find and very potent, so called ‘Spice’ has the full package that a penniless person could look for, but there are also some scary consequences to consider and most users are either unaware of them or simply don’t care. Synthetic marijuana is not marijuana, but rather represents a generic term for a bunch of different chemicals. It became hugely popular all over Britain for a short while due to its temporary legality, but recent legislative changes have outlawed this trade, leaving the vendors with huge stocks they had to sell somewhere. Huge surprise – a large chunk of the legally imported supply ended up in the streets at discounted prices, creating a looming problem on the periphery of the society. That’s because as opposed to real weed, the synthetic version works in totally unpredictable and sometimes dangerous ways, and could be far more devastating on the long term for already vulnerable populations. First of all, it is nearly impossible to determine which substance is actually in the product. There are dozens of various synthetic cannabinoids, and while they all can mimic the effects of marijuana up to a point, they vary wildly in terms of potency and side effects. Mass hospitalizations due to nasty batches are not unheard of, while individual visits to the ER room are relatively common occurrence among those who smoke Spice – although serious damage is pretty rare. Since those products are mostly synthesized in underground labs in third-world countries, it is literally impossible to know the chemical composition of something you bought in a back alley unless you take it for scientific testing (which would of course get you arrested, of course). Dosage is also tricky as hell if you are sitting in a well lit room, let alone in an open-air setting. Literally every bump could be stronger or weaker than the previous one, and there is no way to know in advance. Adding just a little more could push the dose into the red zone and send the smoker into a state similar to a panic attack. Again, overdosing on Spice is not exactly the same thing as with heroin, and addictive properties of synthetic cannabinoids are probably not as severe, but the devil you don’t know could be just as bad. Ingesting unknown chemicals in random quantities is a terrible idea on its face, and that’s before you remember that most of the people on the margins are in poor health to begin with. Indeed, evidence that something should be done about this problem is right there before our eyes. It is becoming normal to pass a completely spaced out person in many parts of London and other major UK cities. Even mainstream media is starting to pick up on the trend, predictably spinning it in sensationalist light and talking about an invasion of ‘Spice zombies’. While such characterization is probably uncalled for, the scope of the phenomenon is providing a legitimate cause for concern, especially since public health agencies are poorly educated and inadequately prepared to deal with the crises of this type. The government’s decision to introduce a blanket ban on all psychoactive substances and close down head shops and online stores apparently led to the current situation, so trusting the same brain trust to come up with a viable solution might be too much. Draconic punishments for dealers failed to result in elimination of synthetic cannabis from the society, but rather pushed the problem one level down the social ladder. The stocks were simply redirected into the black market, into the hands of people who aren’t fazed by the risks since they don’t have too much to lose anyway. In the process, what little overview of the synthetic cannabis market existed in the first place was completely lost. Work on the local level could be more meaningful, but resources of relief organizations working with the homeless are limited and synthetic marijuana addiction is a completely different animal than anything that field workers have seen before. Additional training would take time and money, and both of those are in extremely short supply at the moment. Any long-term solution would have to include permanent housing and employment for the recovering addicts, and that will be impossible unless the central government agreed to foot the bills. Removing social stigma associated with both homelessness and drug addiction is the next level, and it looks it will be a long time before we can hope to achieve it for the majority of those in dire need of help. For the time being, we can fully expect the parade of zoomed out people to continue through British streets. It is difficult to estimate how much is synthetic marijuana worsening their lives, but it certainly contributes to their numerous problems. Since the supply of those chemicals is unlikely to be interrupted regardless of how much money is spent on law enforcement, harm reduction should be regarded as the number one priority. Identifying the most harmful products and informing the endangered populations about them would be a great start, while mobile medical teams could patrol at-risk sectors and provide direct assistance in the field. It would be possible to imagine other effective solutions, but few of them have a chance to make a difference without high-level coordination on the national level.